My friend Gill just can’t pass an aubergine in the supermarket . Who could blame her? That alluring smooth roundness with a rich chocolate-purple skin would tempt most of us to reach out and add one or two to our shopping trolley. 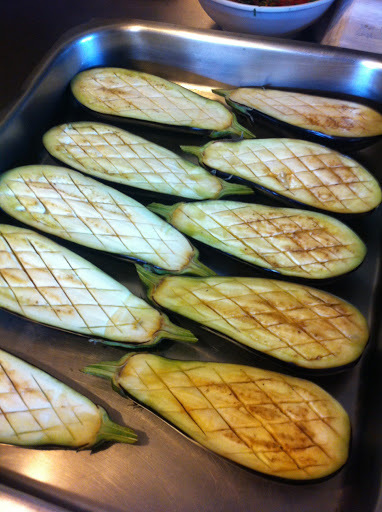 Gill’s first inclination is to make ratatouille but wants some new inspiration for aubergine or eggplant dishes. Cut down the middle, score in a criss-cross pattern and salt – a good pinch per half. Brush halves with herb oil (Rosemary or thyme) that has had garlic blended with the oil. Rub with sweet patrika and bake flesh down. Make sure there is plenty of oil or they will stick and burn. Cook at 180-200 for 20-30 minutes until they don’t bounce back when poked with your finger (same test as for cooking a fish fillet). 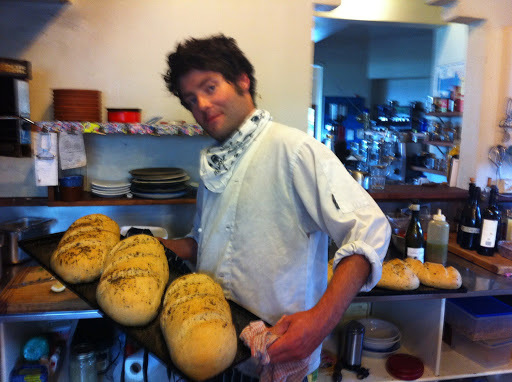 Gus Hayden can be found cooking at the Whitehouse Cafe and Bar in Wanaka most evenings. He was first introduced to cooking to finance his other passion, snowboarding. Gus says he is lucky to be able to live and work in Wanaka. He loves preserving like his grandmother did using the old Agee jars (and is becoming known in the Otago second hand shops as ‘the jar man’). 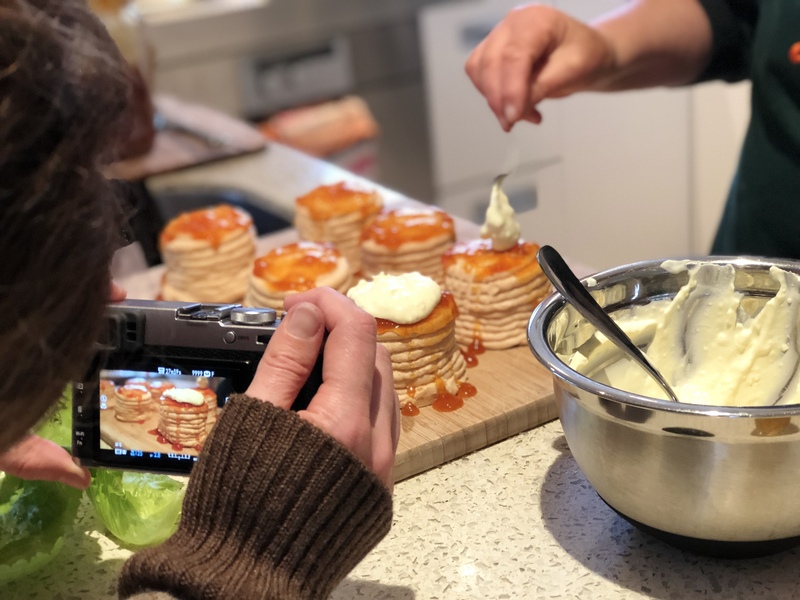 He produces beautiful bottled Central Otago apricots, cordials, curds, quince paste, chilli sauces and various pickles. We are the lucky ones who get supplies each time he comes home to Dunedin. 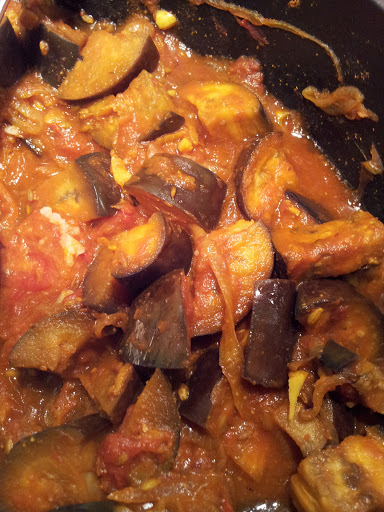 Aubergine is a sponge for flavours, so works very well in a curry with all those spices. 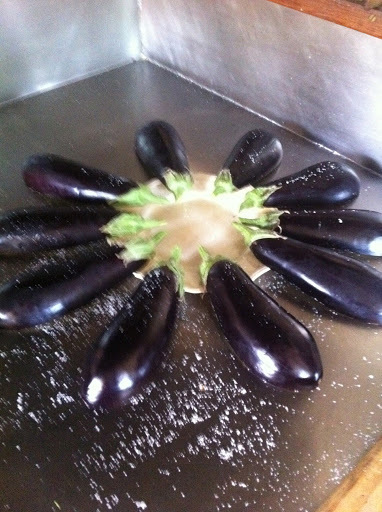 It’s also appropriate as the plant originated in the Indian sub-continent and is known in Asia as Bagan Brinjal. The only alteration I made to this recipe was to finely cut up the garlic rather than crushing, doubled the tumeric because it’s a spice that’s so good for you, and used a can of tomatoes and half a can of water. Emma was right it did taste even better the next day. When picking your aubergine make sure it has a glossy skin with no spots or marks, the green top looks fresh and if possible still has a stem. To test if it is ripe push the flesh and if it bounces back it is ripe. 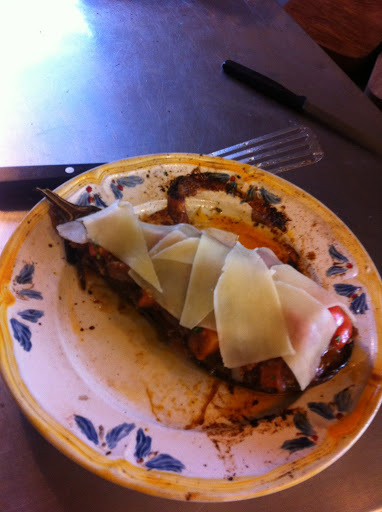 If the indent stays – its not yet ready for eating. If it comes wrapped in plastic take that off as soon as possible. They are so decorative that I usually don’t put them away in the fridge but that does keep them for longer. To Salt or Not to Salt….. 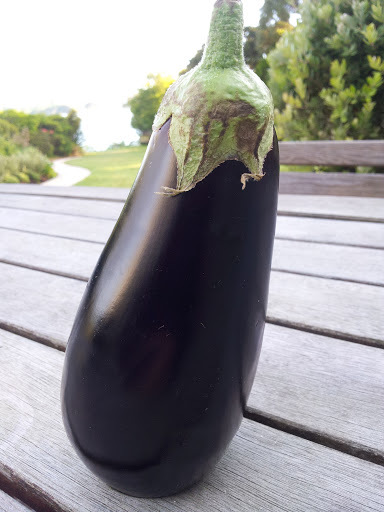 The new varieties of aubergine doesnt tend to be as bitter as those in the past and won’t need “degorging” (salting, rinsing and patting dry). 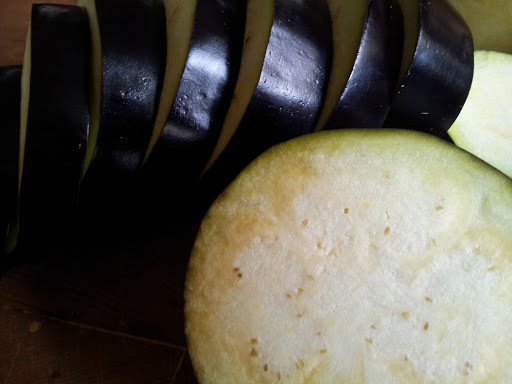 If your aubergine has a lot of the dark seeds it will have a bitterness that comes from the nicotinoid alkaloids found in the brown seeds. Yes there is nictotine in eggplant but you would have to eat 9 kg of eggplant to equal the nictotine of one cigarette. Hugh Fearnley-Whittingstall‘s latest book Veg Everyday matches his recent series tv series when he gave up eating meat to explore the possibilities of vegetables. We too have recently decided to make more meals vegetarian and this book has enticing vegetarian recipes. It’s not that I am against meat it’s just that the more I learn about the benefits of vegetables the more I want to use them. I love the way Hugh lays out and describes the methods of cooking and gives suggested variations to a recipe. 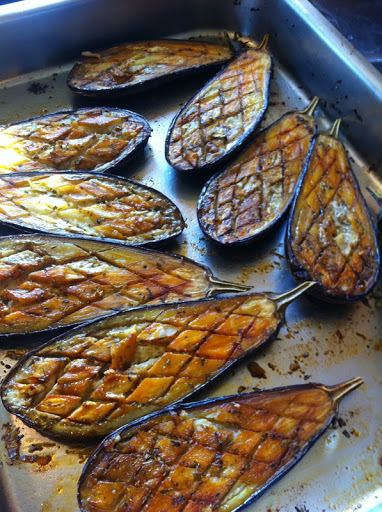 I looked up aubergine and there were three recipes that I would like to try. 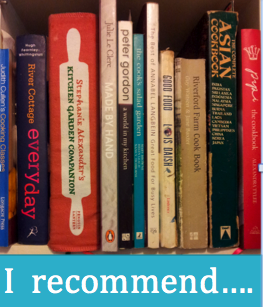 So one more ‘Hugh’ book has found a place on my recipe bookshelves. 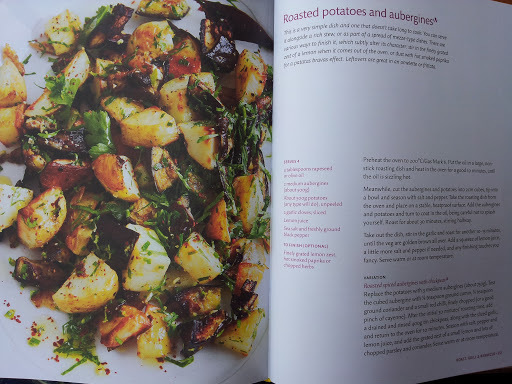 A page out of Hugh Fearnley-Whittingstall’s – River Cottage veg everyday! 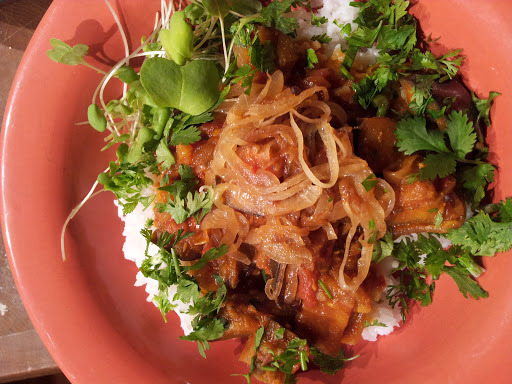 This is one of the recipes I would like to try from Veg Everyday. It’s simple – just roast 2 cubed aubergines with potatoes in hot oil, adding chopped garlic in the final 10 minutes and just before serving add lemon juice, sweet paprika (like Gus did) and chopped herbs. Hugh also suggests adding another eggplant and replacing the potatoes with chickpeas in the final ten minutes of cooking. Aubergine is also called Eggplant as the cultivars introduced to Britain were yellow or white and the size of a goose egg. “Jew’s Apple” was another name in the 18th century, because of its great popularity amongst Jews who may have introduced it to Britain. ← Salad Series I – the salad can be the star!